Are you one of those guys that doesn’t trust buying stuff you can’t physically hold? Well, SEGA might have a solution for you. 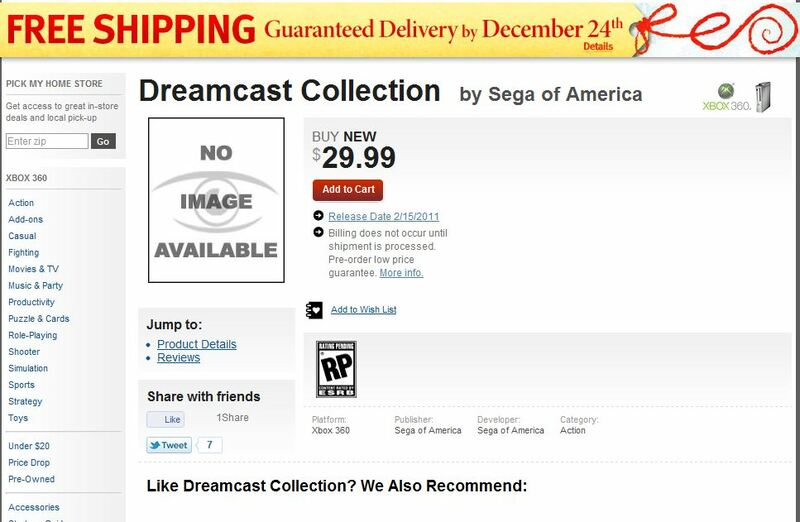 According to Gamestop, they have a ‘Dreamcast Collection’ and will retail for $29.99. As of right now its only listed for the Xbox 360. The product page says it will be released February 15th, 2011. No idea what will be in the package, but I assume its already released games and by February they will have Crazy Taxi, Sonic Adventure, SEGA Bass Fishing, and/or Space Channel 5 Part 2 to consider. Interesting… depending on what's in the package, it might be worth waiting for. Very curious what is in this pack. I would buy it just for one of the greats like JSR, Chuchu Rocket, or SC5. I can't believe I forgot Skies of Arcadia! I got hope! I'll bet its the four XBLA Dreamcast re-releases on a disc, much like how Qubed was the three Q Entertainment titles on one disc. Still very excited to see this! The package art could be awesome and the idea of seeing a Dreamcast related product in a store is exciting. Now SEGA needs to get on a Saturn Collection! Barry, you're a genius! A Saturn selection would be awesome. So many great games missed out by a whole gaming generation. Even 5 or 6 Saturn games on a disc would be awesome. NiGHTS is a given, but I'd also like to see Panzer Dragoon Zwei (the first game was included with Orta and PDS deserves a standalone release due to its size and importance), Astal, Virtua Fighter 2 (with online multiplayer), Burning Rangers and Daytona USA if they can get the license. I think that's a nice variety of some great titles. My safety bet is that some dude mistaken the DLC games for an actual game and put it in the system. Anyway, this could be exciting. I'm hoping SEGA Racing Classic gets a PSN/XBLA release, better that than nothing considering that the Daytona license is a hurdle. I'm interested so long as there is more then 4 games on the disk. Is it to much to ask that they would also include REZ HD? Some Shenmue as well? Shenmue II is already on the original Xbox.. Sharky's list is pretty good, but I cannot imagine there being too many games on this list. Chu Chu Rocket for example is really tiny, but many of the others are not. 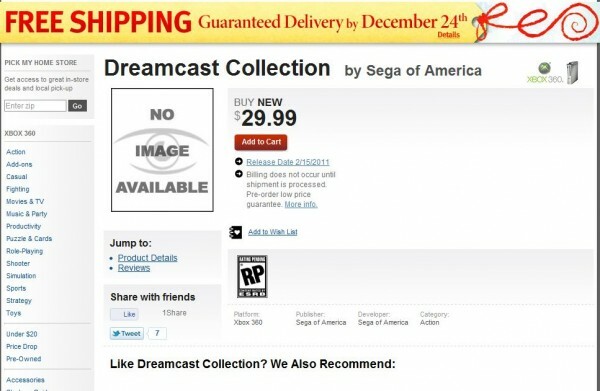 I am not even sure if SEGA is allowed to sell REZ HD by themselves? It's a second chance for the DC, now with no real piracy issues. Hopefully the collections will continue into DC Collection 2, 3, and so on. I think I need to get a PS360 now. The cake is a lie, as it were. It's gonna be Sonic DX, Crazy Taxi, Space Channel 5 part II and Sega Bass Fishing and all be the PC versions under a Dreamcast facade.